Project-Based / Hands-on learning is integral to ACSA’s thematic approach to curriculum. Although some content and skills are taught separately, for the most part, students acquire knowledge and skills through learning that makes connections among varying disciplines. All project-based studies culminate with exhibitions or final products that must meet high standards. These products are the vehicles for students to synthesize what they have learned and to demonstrate how they can use it. ACSA uses hands-on experimentation to help students develop problem-solving skills. 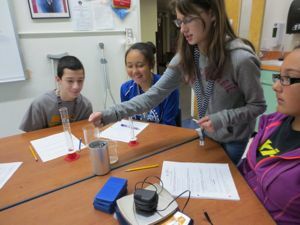 Through the steps of the Scientific Method, students will increase their critical thinking skills and become better problem solvers in everyday life. 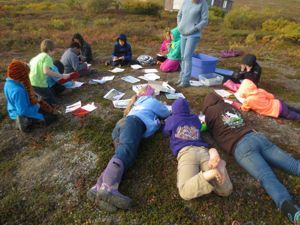 Students will conduct scientific research inside the classroom as well as in an outdoor setting throughout the school year. They will also be sharing their data with scientists and other students from around the world. Much of the curriculum for the year will be designed around a theme. As such, the projects and assignments for Social Studies vary depending on the unit of study. Research skills and study techniques are developed through various types of projects, assignments, and tests. As often as possible, a student is given a choice of topics and methods for demonstrating proficiency. Students will research daily geography or current event warm ups to continually increase their awareness of the world. The reading program is literature based. Students have continual choice in reading for fiction and non-fiction literature. Students are directed to select materials that focus on the themes that are being studied school-wide. The Accelerated Reader computer program addresses the diverse reading abilities of ACSA students. Along with thirty minutes of sustained silent reading each day, we ask parents to monitor additional reading at home.Students will also learn to answer interpretive questions, analyze text and look for meaning in word choice. All of these skills are reinforced during literature discussions. Skills in reading and writing are essential for students to excel in math, science, and social studies. ACSA uses the McGraw Hill Glencoe Math series and the supplementary online ALEKS program. When possible, math concepts are also integrated into science and projects for core subjects. The students will complete math journals to explain the process and logic of solving word problems. Fifth through eighth grade students have a wide range of abilities, so students are placed in many different levels of math. Language Arts class is designed to provide a writing experience every day. It involves journaling, exercises in mechanics and usage, and assignments which use the writing process for both creative and non-fiction purposes. The curriculum provides many public speaking opportunities. ​Art class will be driven by the thematic approach to learning. Students are given the opportunity to express themselves in several different ways, depending on the medium being used or studied. Concepts such as balance and texture and as well as technique are taught repeatedly throughout the year on all projects. Students are expected to give their best effort to learn these things and work towards achieving true "mastery" of the selected medium. A student takes an elective class each quarter. Electives that are typically offered include Technology (content based on ISTE standards), Physical Education (may include swimming and outdoor education), and Life Skills (may include health education and home economics).